BIKINI BODY MOMMY™ — DON'T BE A BUTTERBALL THIS THANKSGIVING! Join me for the next Official BIKINI BODY MOMMY™ 7 DAY SURGE and lose between 5-10 POUNDS this year BEFORE Thanksgiving! This is the LAST LIVE 7 DAY SURGEI am hosting THIS YEAR, so DON'T MISS OUT! Katie LOST 8.5 POUNDS on the 7 DAY SURGE! "I have been close to my target weight for months now but keep fluctuating up and down and never manage to lose those last few pounds. This is my first surge and it was just the boost I needed as this morning (Day 8) I weighed in at my target for the first time since I met my husband. I'm off on a beach holiday this weekend and actually feel proud of how I look in a bikini (well at 35 anyway). My husband has been doing the surge with me and having him as extra accountability was priceless. The first few days of the meal plan were tough but we made it through the fog and came out the other wise with a better understanding of our cravings and bad snack choices. Especially the "I'm bored" relentlessly munching on goodies. 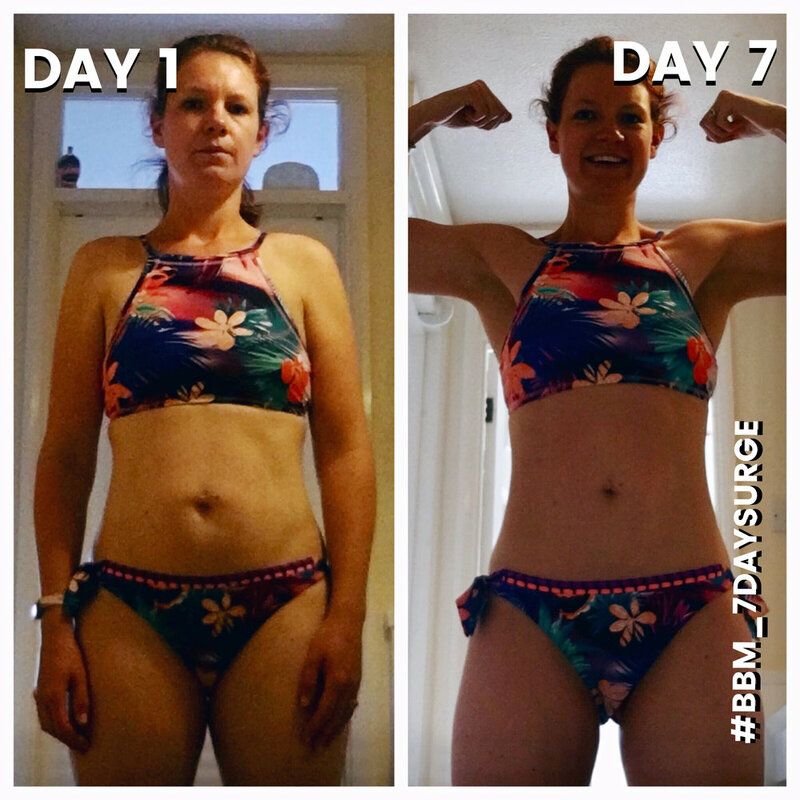 Thank you to Briana and everyone at BBM for all your help and inspiration x"
Liz LOST 8 POUNDS on the 7 DAY SURGE! I've been following Briana for 3 years. I finally pulled the trigger on the surge when I realized that when I stopped nursing my 1 year old I couldn't get the weight off. Boy did this work! I followed the meal plan and exercise 100%. It was hard but I got it done. I've learned some great recipes and have been able to keep up the majority of the nutrition even a week later. I lost 8 pounds and 6.25" during the surge! I look forward to following you and seeing the other amazing things you come up with for or community! Thank you Briana! Erin LOST 5.5 INCHES on the 7 DAY SURGE! The BIKINI BODY MOMMY™ 7 DAY SURGE is an online workout and nutrition program, designed to provide the quick-fix solution to help blast through plateaus and get you AMAZING RESULTS in just 7 DAYS! Without having to spend countless hours in the gym, the 7 DAY SURGE is a 20-minute home-based program that was designed as an EXTREME 7 DAY SOLUTION to help blast through plateaus, and achieve dramatic results in situations where you need to look and feel your best-- in little to no time. Do you have an upcoming special event, social function, or family vacation that has you wanting to hide under a rock instead of proudly and confidently engaging in LIFE and owning the skin you are in? Perhaps you've been working out consistently for weeks (or even months) and lately you've been "STUCK" with little to NO RESULTS (a.k.a the dreaded "plateau")?! Regardless of the reason's why you are considering the 7 DAY SURGE I want you to know that I am thrilled that you are here, and if you are ready to give the next 7 DAYS your all I want you to know -- THIS PROGRAM IS FOR YOU! • INTRO VIDEO -- Learn the basics of the program and what to expect. • MEAL PLAN INTRO VIDEO -- Learn the in's and outs of the SURGE meal plan, and how-to "BATCH COOK" like a boss. Older PostDon't Forget to Turn Your Scales back 10 POUNDS this weekend!